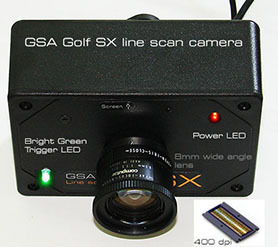 Please note that GSA Golf camera systems are not plug 'n' play and may require some time to setup. 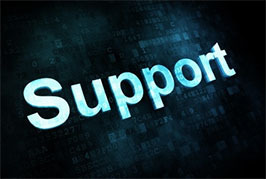 others - with lower technical abilities - may require longer to setup the systems and require support. Also note that PC's may have to have additional powered USB hubs and dedicated USB channel card(s) added if using more than 2 or 3 cameras. Powered USB hubs are around $16.00 each and dedicated 4 USB channel cards cost around $85. Warning! Multiple camera systems of 4 or more cameras require that the host PC be capable of running 4 or more cameras. There's now a "Screen Shot" button on the left side of all the main screens in the Control Panel. which in turn will calculate the ball's flight trajectory and launch the ball in the system. 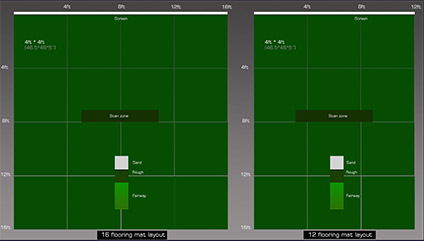 red line dictates the maximum ball height a ball will have to be considered as a rolling ball or sculled shot. (10 milli seconds here) and the pixel to cm scale (0.2 here) is constant - which it always is - this correlation is constant and consistent. 9. Carry adjust mode - when set on, carry distances can be adjusted for every club. (Note this function is now superseded by carry adjust features in the game application. 10. System Status - The status squares - which are normally red - turn green for a few seconds after a swing. They show that the system has captured frames and club track and that the data is valid. 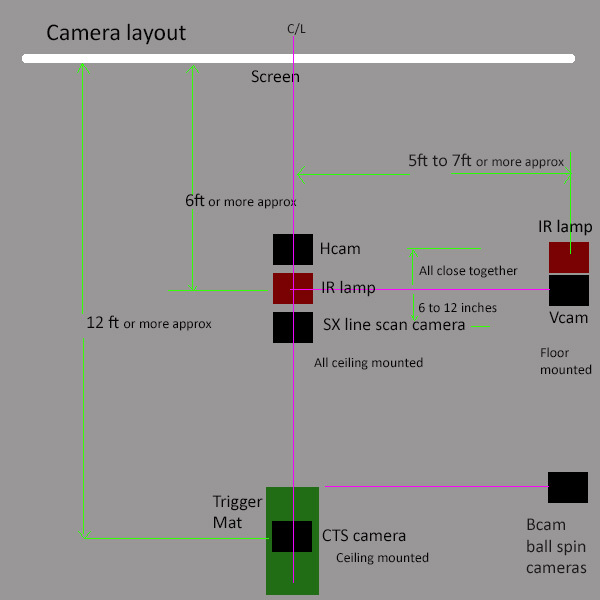 This is the basic floor layout for the 6 cameras. Please note: Camera systems require setting up and are not plug and play. and then adding the extra cameras once the CX2 mode cameras are fully functioning. 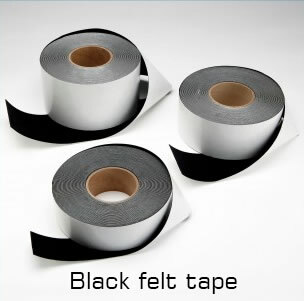 then these should also be tested independently first. 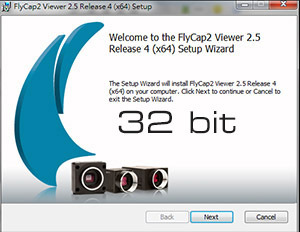 Note that multiple camera systems will require a PC that is capable of running multiple cameras. (see the Using multple PCs with multiple cameras below for more information). 4. 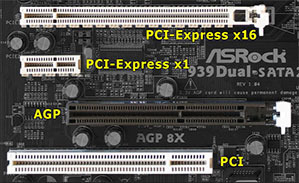 If using more 3 to 4 cameras, at least one free PCI Express X4 or X16 slot should be available to add a dedicated channel USB bus expansion card. 5. If using more cameras than 4 cameras , at least two free PCI Express X4 or X16 slots should be available to add a two dedicated channel USB bus expansion cards. Note: even though your PC may feature multiple USB ports, these ports will probably be running or shared on the same USB bus and or hub so you'll still need to add the additional PCIe multi channel USB card. Failure to do this may result in camera images being corrupted or cameras not being detected or cameras not responding to trigger signals from either the SX line scan camera or the trigger mat. Also note that PC's may have to have additional powered USB hubs and dedicated USB channel card(s) added if using more than 3 cameras. Powered USB hubs are around $16,0 each and dedicated USB channel cards cost around $125. Are the USB cables to the cameras too long? 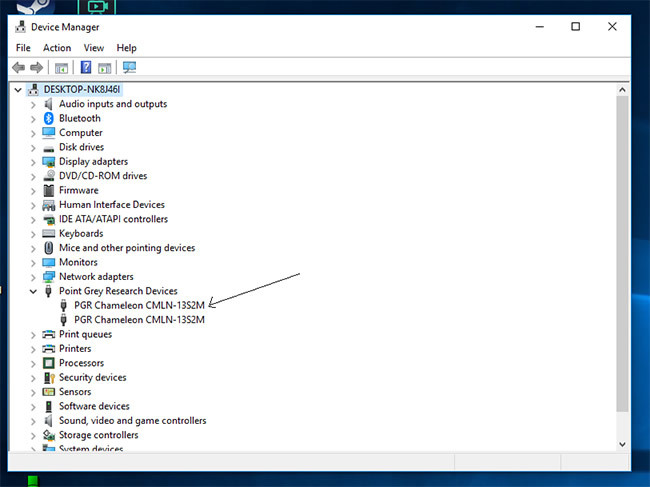 Once the drivers are installed and the cameras connected to the PC you should see in the Windows Device Manager that the cameras are detected as PGR cameras. (i.e. not using our PCs) will be able to run all the cameras. (see the Using multple PCs with multiple cameras. Most systems are supplied with at least two cameras. 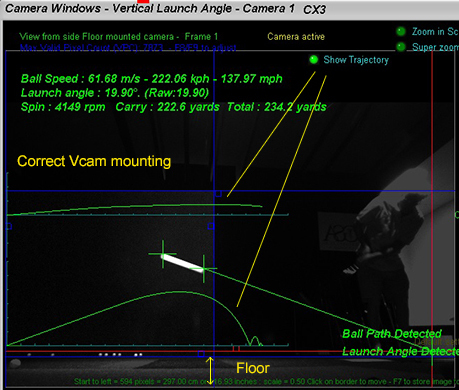 One for the vertical launch angle and ball speed (Vcam), the other (Hcam) for ball path. It is important to identify which camera is which before mounting. Usually the cameras are marked Vcam and Hcam on the casing but in case they are not you must identify the cameras yourself. 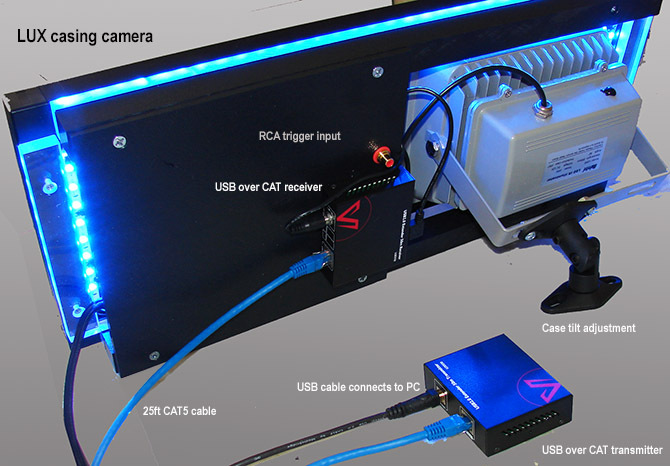 To do this, connect both cameras to the PC via the USB cables, start the GSA Control Panel and go to the Cameras window. 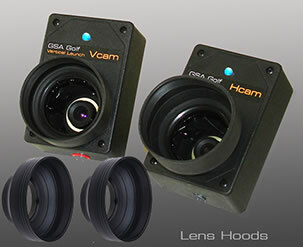 The floor mounted Vcam camera is always assigned to camera 1 and the overhead Hcam camera as camera number 2. With both cameras lying on the floor, point one camera in one direction and the other in another direction so that you will be able to identify which captured image is from which camera. Click the Soft Trigger button in the Cameras window of GSA Control panel and you should see what camera has been automatically assigned as the Vcam and and what camera has been assigned as the Hcam. 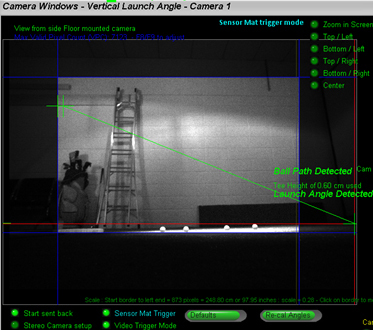 The vertical launch angle camera is floor mounted either left or right and in line with the SX Line scan camera and Hcam. The ball path camera is overhead mounted next to the Hcam camera. Start the GSA Control Panel. 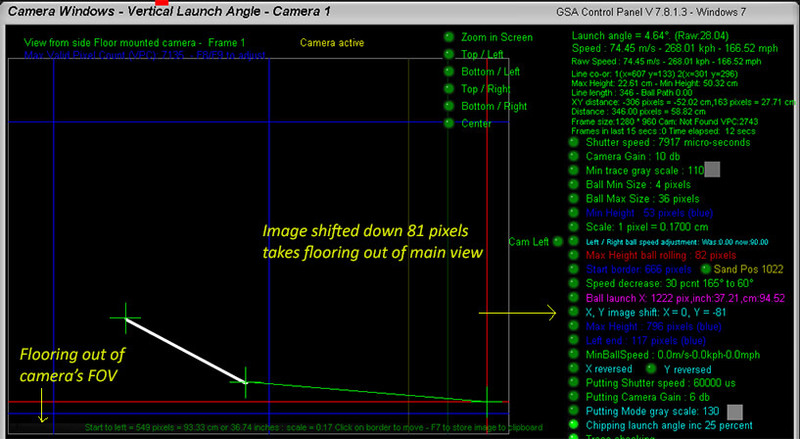 You should see from the GSA Control Panel's main window that the camera has been detected and that the camera engine is running. Go to the Setup Window and ensure that the Vertical Camera radio button has been activated. Go to the Camera Window in GSA Control Panel. You should see that camera 1 has been found. Click the Soft Trigger button to capture a single new image. You should see that the image has been updated. Select the Video Stream Mode radio button. You should see that images are being continuously streamed. You can stay in this mode to align the camera to the desired FOV and set the focus. 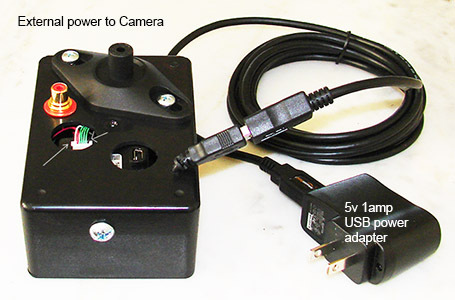 External 5v power is supplied by low cost USB 5v, 1 to 2 amp USB adapters. Newer cameras have a separate USB power connector on them. Use a 5v 1 or 2 amp or more adapter for the power connection. Only connect the mini B USB connector on the back of the camera to the PC. 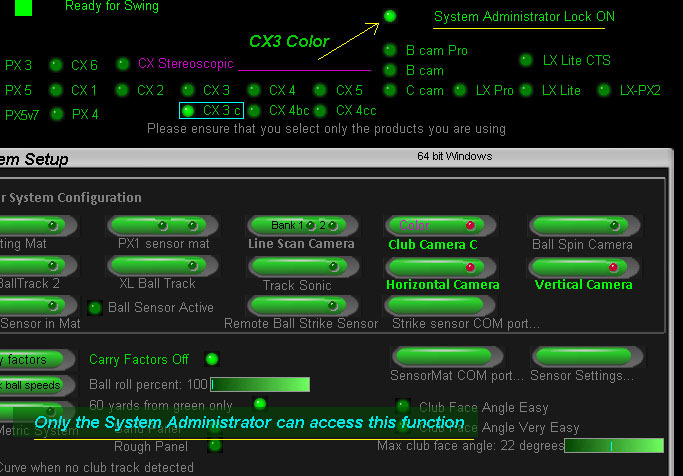 In the control panel cam 1 is the ball launch angle camera, cam 2 is the ball path camera, cams 3 & 4 the club tracking cameras and cams 5 & 6 the ball spin cams. Note that most users will be using 3 PCs for a 6 camera system (one master and two slaves) and most users with a CX4 4 camera system will be ising 2 PCs - one Masrt and one slave PC. This setup should be mounted approximately 4 to 5 feet away from the normal hitting position and 5 or more feet away from the screen. will / may get into the line scan camera and thus won't function correctly. Vcams are now supplied with a base plate mount. 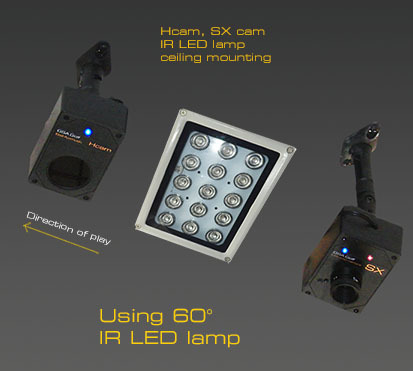 We recommend mounting the second IR LED lamp next to the Vcam so that the ball is also illuminated from the side as well as from above. Ensure that cameras are mounted at least 5 or 6 feet from the screen! 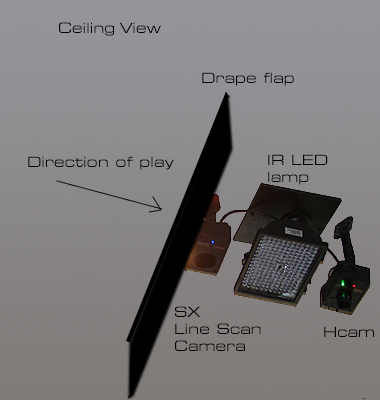 The cameras and lighting should be mounted similar to those shown in the above floor plan image. If you don't have this space then the distances can be reduced somewhat. 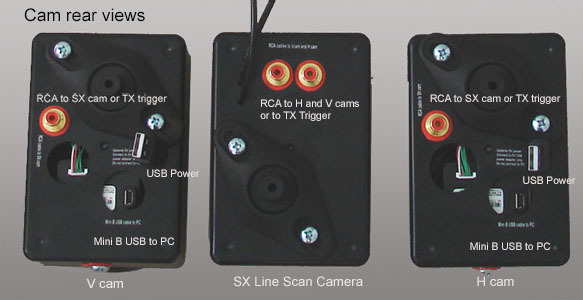 Once the cameras are mounted , connect the camera USB cables to available USB ports on your PC and the camera trigger cables to the trigger sensor array. Camera orientation should be set so that the screen appears (or would appear if in the FOV) on the left side of the camera image. Note that newer cameras have a separate USB power connector on them. Use a 5v 1 amp or more adapter for the power connection. 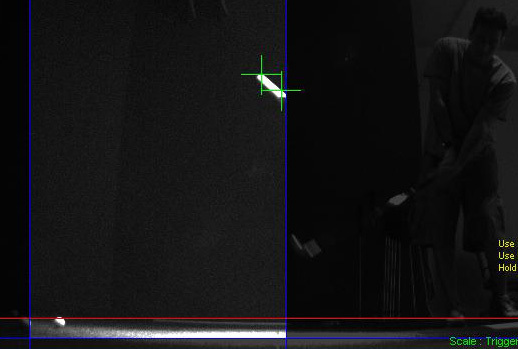 The above 2 images - that are direct from a customer remote support recently - show that the ball traces using just the supplied single IR LED lamp are perfect. 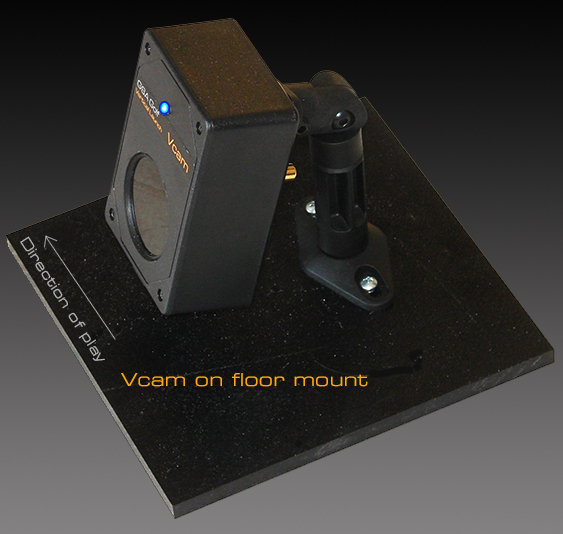 The Vcam (Vertical launch camera) is floor mounted (either left or right hand side of the enclosure or room). 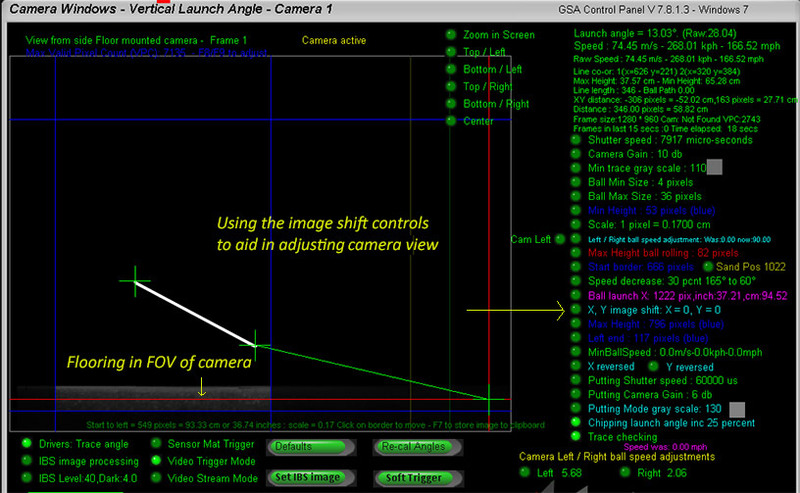 The camera views the ball from the side and measures ball launch angle and ball speed. 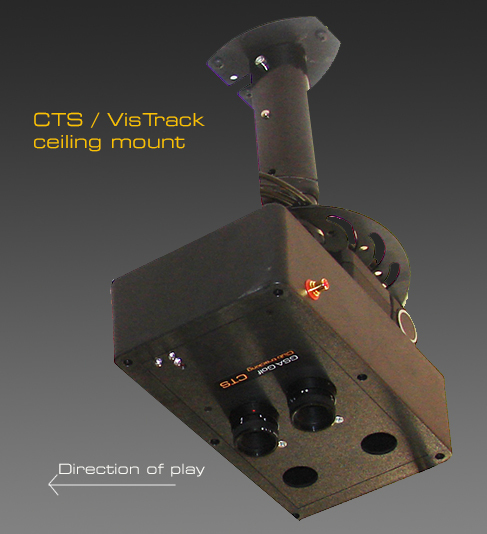 It is mounted in line with the overhead mounted Hcam and Line scan cameras (as shown in the above image). The Vcam camera should be facing the opposite wall and tilted up some 25 to 30 degrees. If the Vcam is not tilted upwards then too much floor will be in the FOV of the camera (as shown in the above left image). When adjusting the camera's aim, switch to "Video Stream" mode in the CP's camera window. The Hcam (Horizontal plane camera) is overhead mounted. It should be mounted such that the ball's direction of play is right to left as viewed by the camera. On the back of the camera you should see the text "Screen" to help assist with the mounting direction. Mount such that this text is towards the projector impact screen. 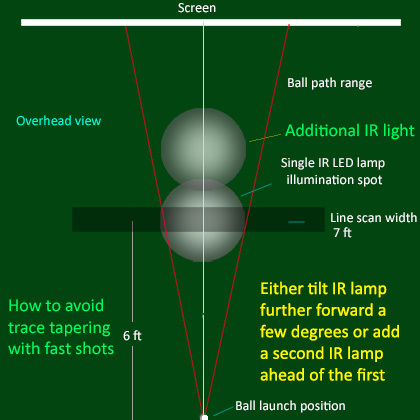 The above 2 images show what the ball traces should look like using just the supplied single IR LED lamp. s or floor mounted trigger array or both . 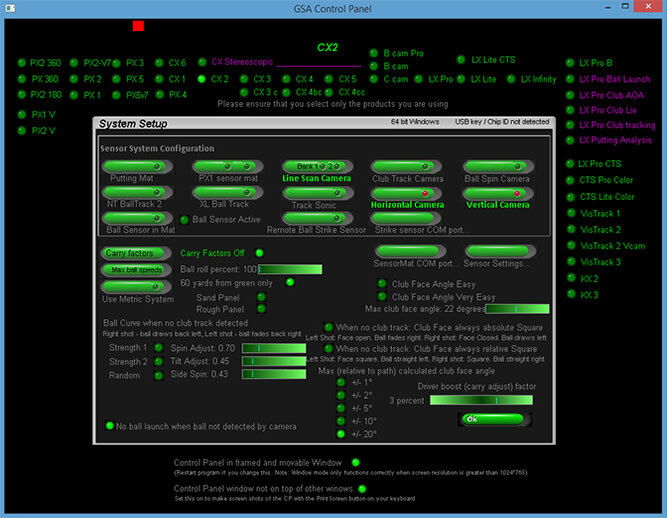 Start the GSA Control Panel and select the CX2 system in the Setup window of the Control Panel and click "OK". You should see that the cameras 1 & 2 are detected and running as shown in the above image of the Control Panel's main window. Click the "Cameras" button at the bottom of the main screen to go to the cameras window. 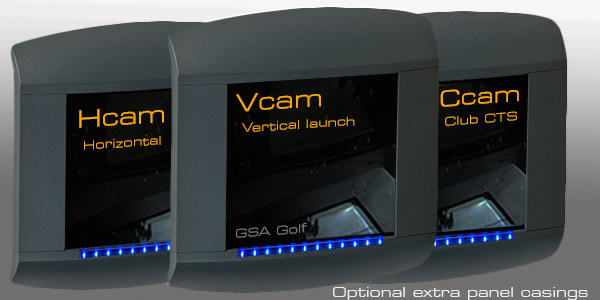 Switch to Camera 1 - the Vcam vertical launch camera. that a new camera image has been captured in the Control Panel's camera image window. Now hit or throw a ball from the normal hitting position under line scan camera or if using a trigger array, over the trigger sensors. You should also see that a new camera image has been captured in the Control Panel's camera image window. 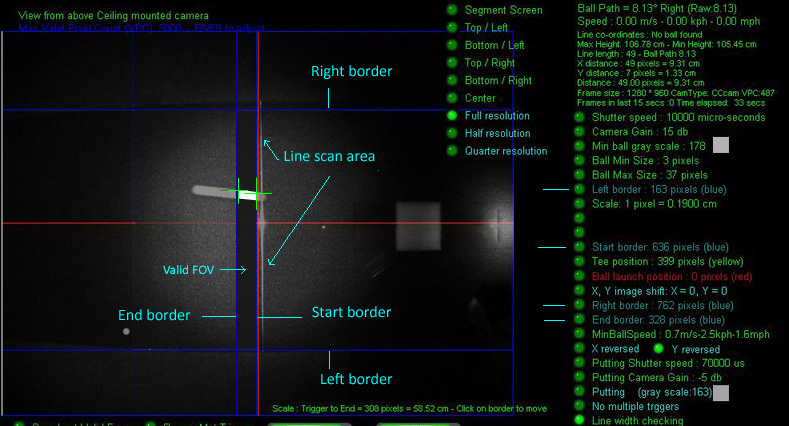 Do the same for camera 2 - the Hcam camera horizontal ball path camera. 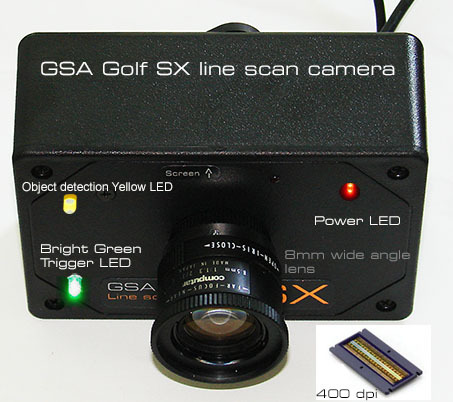 If you do not see that the green light on the SX camera flashes on when an object is passed under it or the green light is permanently ON then go to the Line Scam camera setup page. If the green light flashes ON but only the Vcam or only the Hcam capturers a new image (i.e. 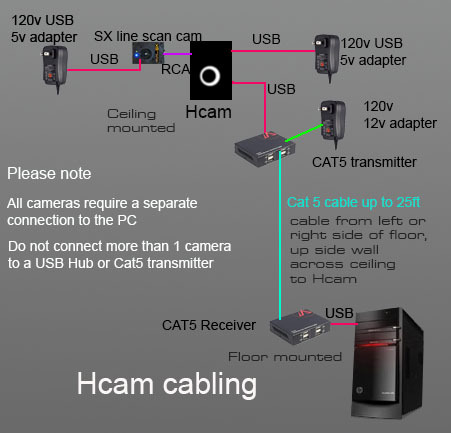 the Vcam does but the Hcam doesn't or vice versa) then try switching the camera USB connections. 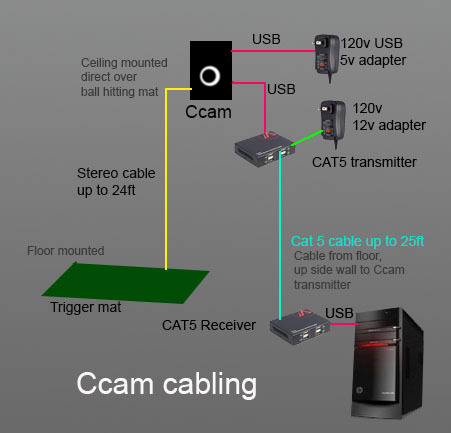 i.e connect the Vcam to a port on the back of the PC and the Hcam to a port USB port on the front of the PC or vice versa. This ensures that the cameras are running on separate USB channels. i.e. if both cameras are running on the same USB channel then only one camera will be able to supply an image. 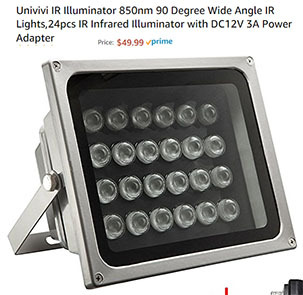 If you find that the direction is 180 degrees reversed, then you can use the "X Reversed" option in the Camera window of the Control Panel to correct this. If the image is only 90 degrees reversed, then you must rotate the camera 90 degrees to fix this. "Launch Dada Ready for Game to Read" as shown in the above image. 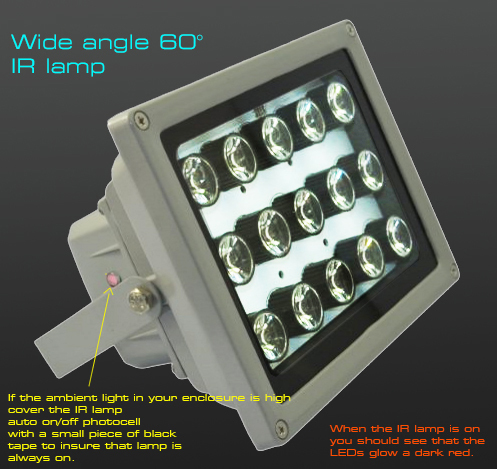 In order to keep the enclosure as dark as possible so that projected screen image is of best quality, we're recommending dual IR (Infra Red) LED lamps for all ball tracking cameras. with no visible light getting in your eyes or on the screen and - in comparison to Halogen lamps - stay cool and last much longer. 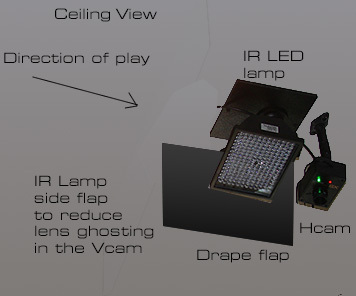 To help reduce lens ghosting in the Vcam it is recommened to mount a side flap next to the ceiling mounted IR lamp. Mount the flap on the same side as the Vcam. 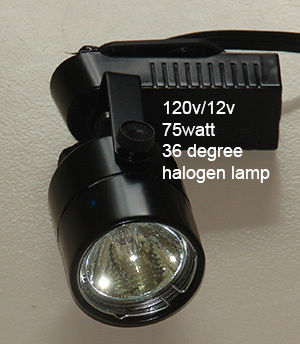 All cameras also work very well with Halogen lamp lighting. 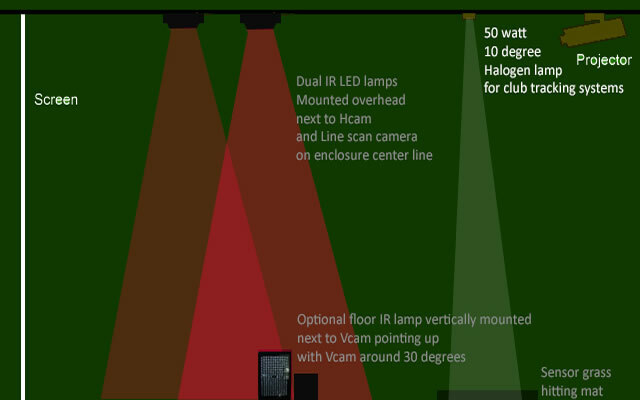 Note that both the Vcam and floor mounted IR lamp are tilted 30 or so degrees upwards. 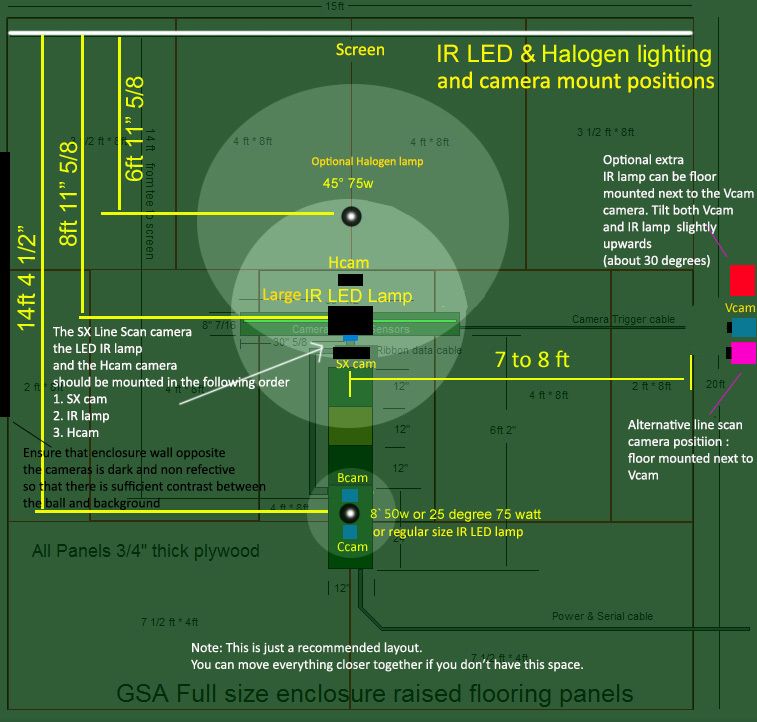 The above image shows the standard and recommended lighting positioning. It is essential that this material is non-reflective! And that there are no reflective objects in the valid field view of the cameras. Normally both the opposite wall from the floor mounted camera and the surface in the valid field of view of the overhead camera will be covered in some type of carpeting. 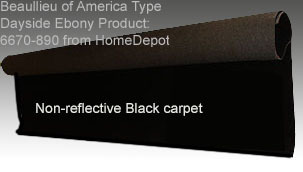 A recommended carpet is : Beaullieu of America - Type: Dayside Ebony, Product 6670-890 which is available at your local Home Depot store at around $4.00 a ft 6ft wide. Regarding the optical sensor camera trigger array, the carpeting should be cut to size in 2 strips and glued to the acrylic glass top of the trigger casing leaving a 1/4 inch space gap for the optical sensors. The optical sensors are in line with the green LEDs. This carpet is also very good for lining the inside of your enclosure. Especially for the wall opposite the vertical camera. You do not have to carpet the complete enclosure: only the part in the valid field of view of the camera. 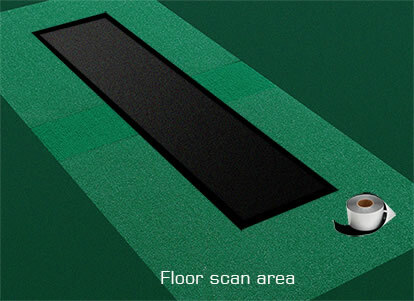 The flooring area directly under the line scan, IR lamp and Hcam cameras must be dark and non reflective. It is essential that this material is non-reflective! And that there are no reflective objects in the valid field view of the cameras. Well ... not exactly super non-reflective but this new "less reflective" turf carpet works really well. i.e. 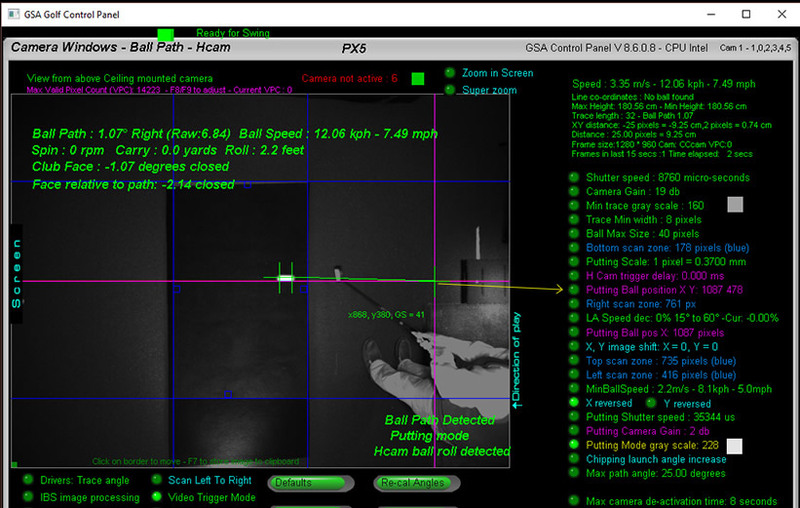 rolling balls / putting are picked by the line scan camera which means all other shots will do too. but will be available as an optional extra and will be supplied as standard with all new full scale F series systems at the new F series prices. The above Vcam image is from a customer that obviously missed the instruction that the background in the FOV of the camera should be non-reflective. This is what the background and a ball trace from the Vcam camera should look like. 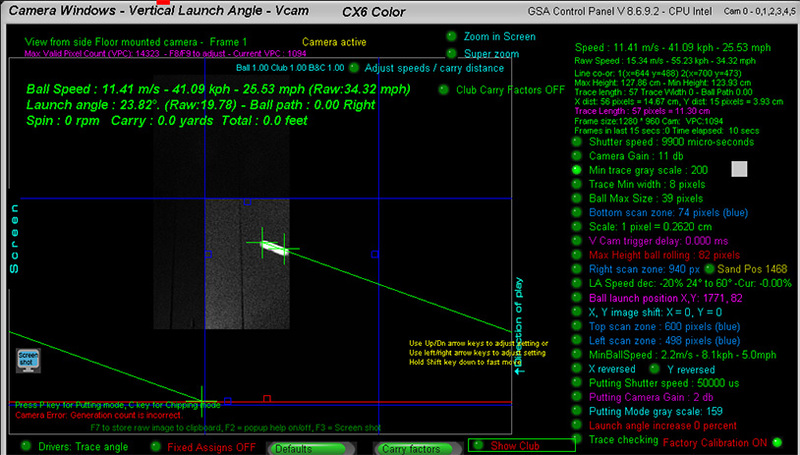 Customer "Ken" sent us this Vcam image after a shot. Notice that the bright ball trace is not being picked because the background is too light. After eiether reducing the Vcam camera gain or increasing the "Min ball gray scale" to 200, the problem is solved. When using regular grass turf flooring, the contrast between the ball trace and the underlying grass turf carpeting will not be so great. IBS methods are used to significantly reduce the brightness of the background in order to accentuate and incease the contrast of the ball trace in the V and H cams. The above test image shows a ball trace with a very bright background. Without IBS, the CP can't detect the ball trace. i.e. it picks up pixels in the background. 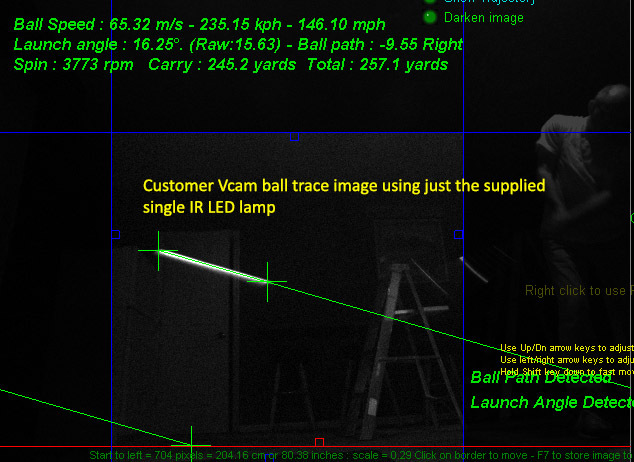 With IBS ON, the background is reduced in brightness to reveal the ball trace. and vice-versa, anything found in both images is reduced in brightness (this will be the background). To activate IBS in the V and H cams, switch the IBS option ON (lower left side of the V and H cam windows). and click the "Set IBS image" to grab and store an image of the background without a ball trace in it. Do this separately for both the V and H cams. IBS requires that the actual background during the game remains constant and is the same as the IBS background image initially set. Other than other objects being placed in the FOV of the camera, changes in ambient or other lighting will also effect how well IBS will function. If ambient lighting is changing during the day or game, regular new IBS background image setting will be required. This process can also be automated. i.e. a new IBS image can be automatically triggered and set every 60 seconds or so. 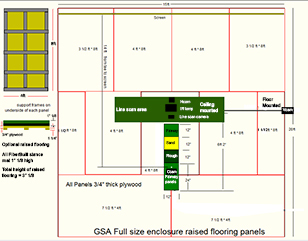 Start the GSA Control Panel and go to the Setup window. Use the presets CX2, CX3, CX5 etc shown at the top of the Setup Window and go to the Cameras window. You should see that the camera(s) are detected and running. Starting with camera 1, switch to Video Stream Mode. If using multiple cameras, you should ensure that camera 1 is the floor mounted vertical launch camera. If the view displayed for camera 1 is from the ball path or club track camera then you need to switch the cables to the USB ports. Caution: Do not remove any camera USB cable while the camera is running. 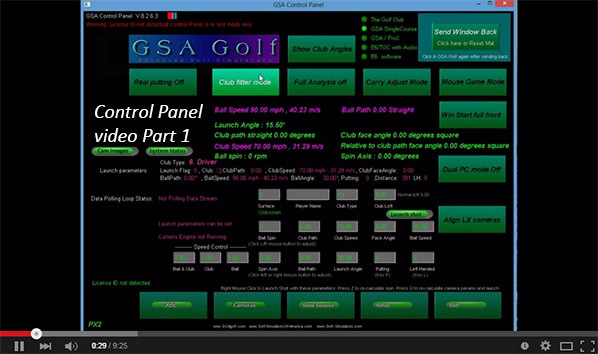 Before hand, shut down the GSA Golf Interface or ProX software. Otherwise the camera engine may hang which may require re-booting the PC. apart from the illuminated floor and any other objects out of the camera's valid FOV (field of view). If this is not the case, then you must ensure that anything in the valid FOV is of a non reflective nature and dark. ie the enclosure's background is dark and there are no other objects in the valid FOV causing reflections. Ensure that the captured images are sharp and clear. Adjust the lens by screwing in or out if not. Adjusting the camera's view and setting the valid FOV borders. 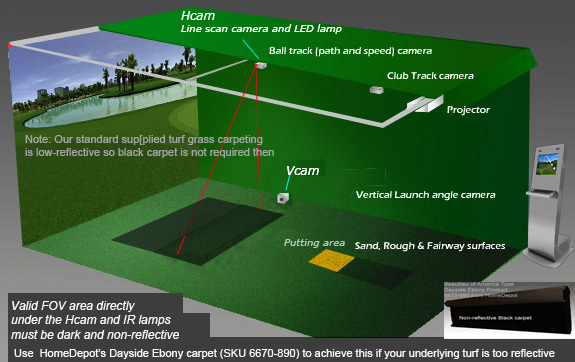 The system searches for golf ball traces only in a certain segment of the captured images and does not use the entire FOV of the camera. This segment is determined by the blue border lines. 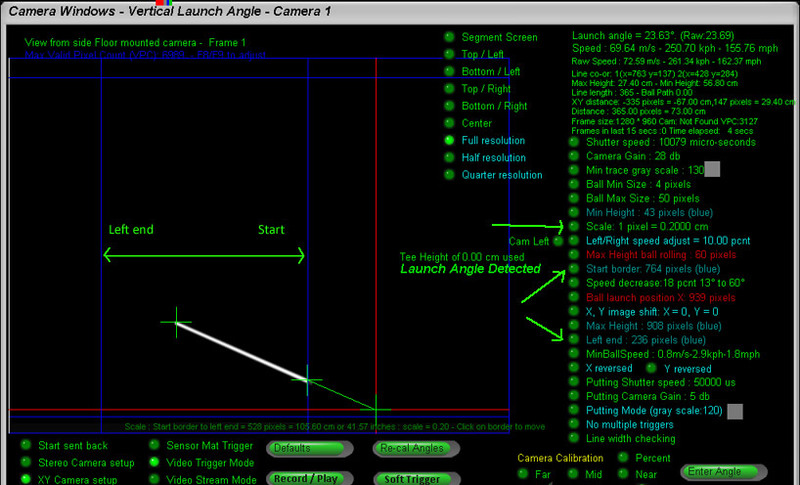 In the case of the vertical launch camera this is Min / Max height and Start and End borders. These define the Valid FOV and are preset but you may need to adjust slightly according to your enclosure. To test, place two golf balls at either far end of the sensor array trigger but so that they do not actually cover any sensors. Aim the camera so that both balls are as low as possible in the FOV. Place the balls at different distances if the ball nearest the camera is obscuring the further end ball. the direction of play in the camera image is always from right to left. If you have mounted the cameras so that this is reversed, then select the X Reversed setting. If the ball direction in the camera image is going up to down or vice-versa then you will have to turn the camera 90 degrees. Select the Min Height button and use the keyboard arrow keys to adjust the Min Height blue border line so that the visible floor is below it. Select the Max Height for Ball Rolling button and use the keyboard arrow keys to adjust the red border line so that the ball at the far end of the trigger is just below it. The Start blue border should be set exactly in line with the line of trigger sensors. 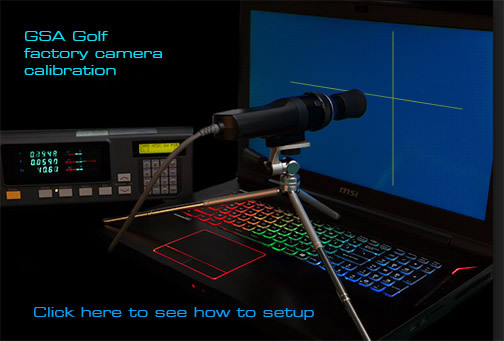 To ensure this place a golf ball next to and in line with the sensors and grab an image by clicking the Soft Trigger button in the Camera window. Move the Start Border line so that the line is down the center of the ball in the image. Double check by taking a shot so that you can see that the start of the ball trace is in the valid FOV. shows that the ball trace is starting way behind the start border line. 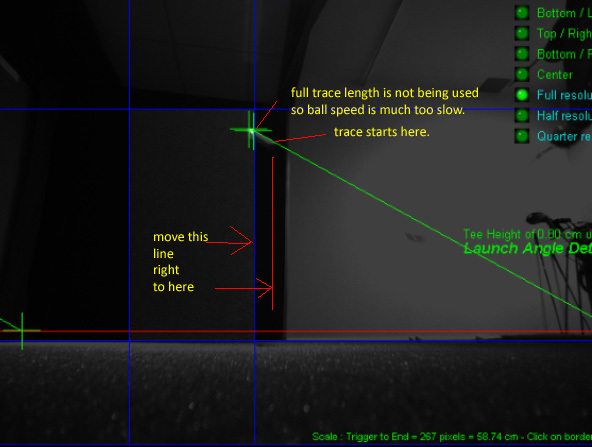 The start border must be moved to just behind the beginning of the trace so that the full trace length is in the valid FOV. The Left End and Max Height border lines should be set to cut out any bright objects in the FOV. After adjusting the angle of the Vcam you may still find that the flooring is still in the FOV of the camera. Using the Y shift control allows you to bring the view of the camera down. Ball speed is directly proportional to the length of the ball trace captured by the camera during the exposure time. Time is simply the camera's shutter speed i.e. exposure time. Distance is the length of the ball trace. As the camera sees only pixels a real distance-to-pixel scale factor must be used to calculate the real distance traveled. The system uses the scale value to calculate the real distance (in centi-meters or inches) the ball has traveled during the exposure time. Thus, adjusting the scale factor will increase or decrease the measured ball speed and thus the carry distance of a shot. 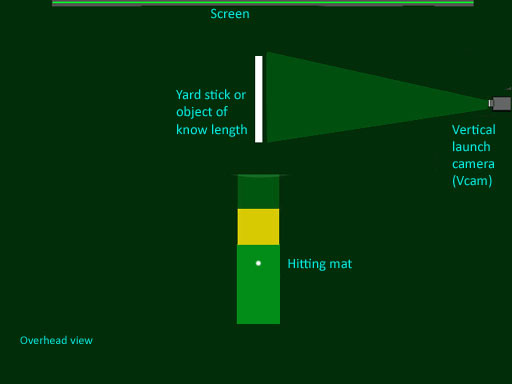 To set the scale setting place a yard stick or any object of a known length on the floor in front of the vertical camera at the same distance as the tee on the hitting mat. 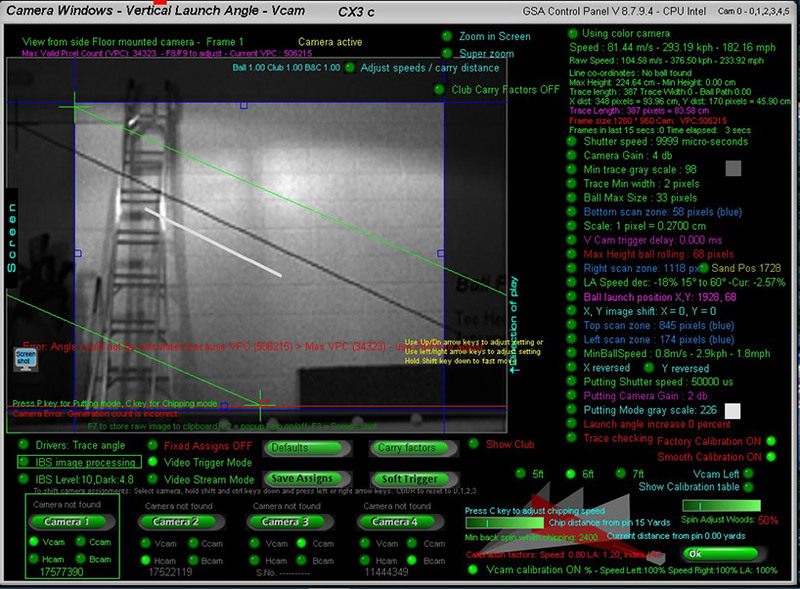 In the Vertical launch camera window of the GSA Control Panel click the Soft Trigger button to capture an image so that the yard stick is visible. 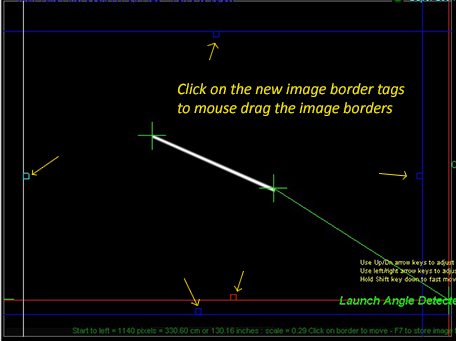 Move the Start Border line to one end of the object and the Left End line to the other end. Adjust the Scale factor so that the calculated length (shown at the bottom of the image window) is equal to the known length of the yard stick or object in the captured image. Testing the vertical launch camera. 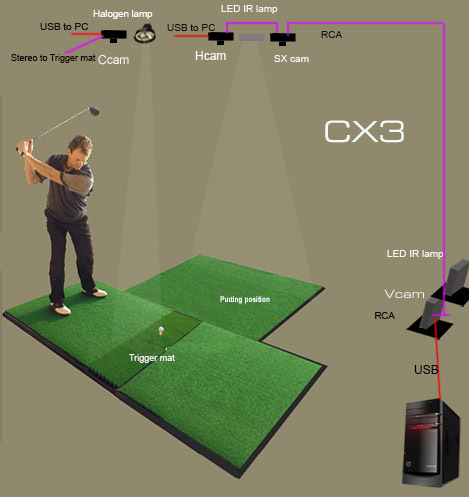 Select Video Trigger Mode and hit a ball. You should then see the trace of a brightly lit ball in the image with two green crosses at either end. 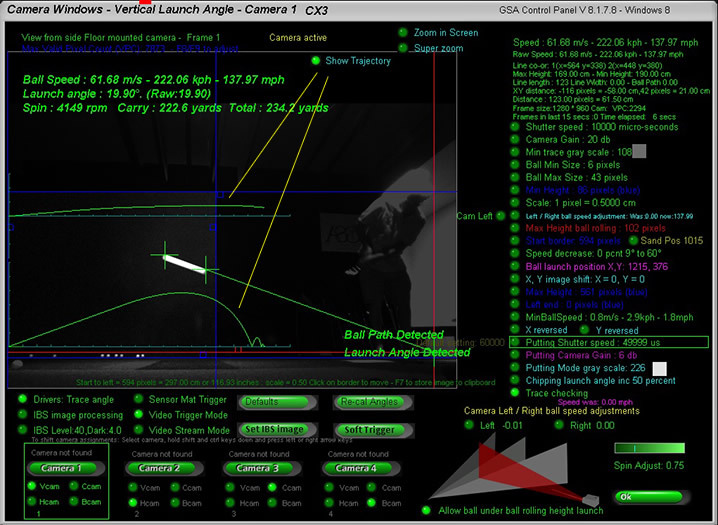 The read out at top right of the screen should show the measured launch angle and ball speed. If the ball trace is not completely within the blue border lines, then adjust these accordingly. If you do not see anything, then check that the trigger function of the camera by passing an object (a club or your foot) over the trigger sensors. You should see that the camera will take a shot every time. 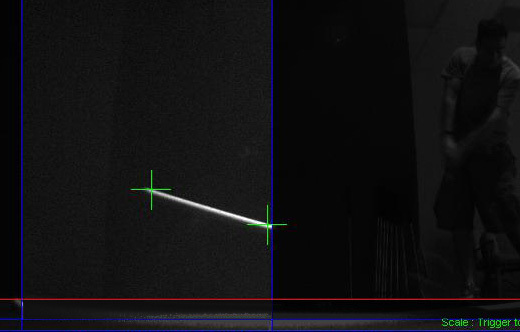 Depending on your specific lighting conditions, you should adjust shutter speed, camera gain and gray scale to obtain ball trace images similar to those shown below. If you like you can now switch to Raw launch angles. The raw angle is the angle between the start and the end of the trace instead of between the defined ball launch position and the beginning of the trace. Use the new "Use RAW launch angle" button to switch this on or off. 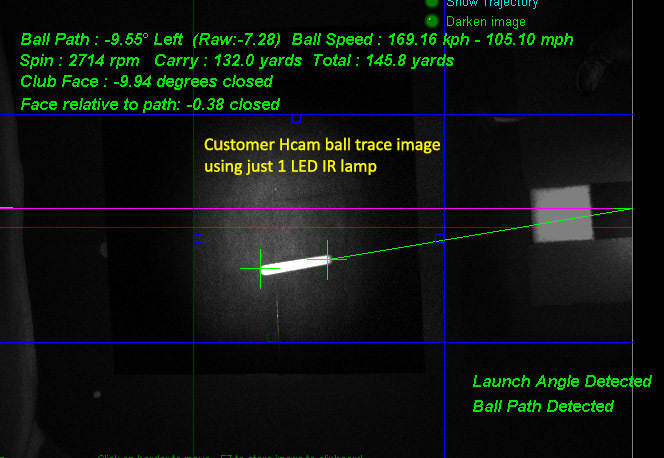 Note that when using raw angles the angle measured between small traces won't be so accurate and when chipping, the ball may already be on the downward path in which case the ball launch reading will be negative. When setting the ball launch position you might find that this position is not in the field of view of the camera. i.e. it's further right. In this case continue moving the launch position further right until you see the launch position wrap around in the camera window - as above. The distance that launch position is from the trigger is displayed in inches and centimeters. Physically measure the distance the launch (tee) position is on the sensor mat to the trigger array and set the launch position in the camera window to correspond to this. Another way of doing this is to make a shot so that you can see the trace in the camera window. 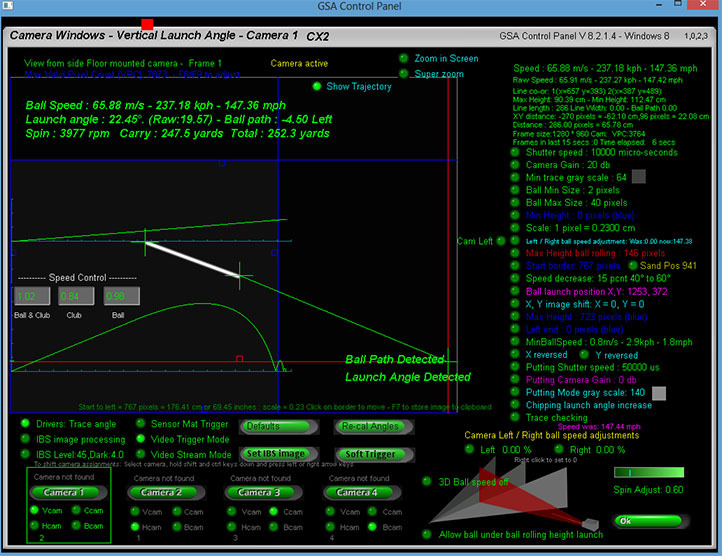 Then move the launch position so that the launch angle is the same as the RAW angle - as shown in the above image. 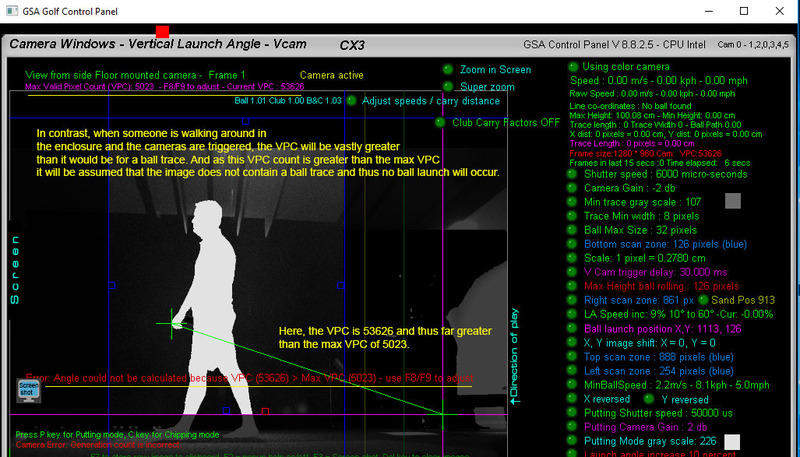 so that the system can calculate the vertical launch angle from these positions when hitting from sand or rough. As of version 7.4.7.2 of the Control Panel these positions can be automatically set to their defaults by right clicking anywhere on the screen when in Sand or Rough positioning mode. The positions are shown in fainter shades or yellow (sand position) and green (rough) position. They will normally be 12 inches and 24 inches ahead of the normal launch position on the tee. Adjusting the measured ball speed and ball carry. The above video shows how to adjust both the measured club and ball speeds to effect ball carry distances. The speed of the ball is dependant on the distance the ball traveled within the camera time frame (shutter speed). If you find that high shots are carrying too far in the game software, you can use the Speed Decrease setting in the Vcam window to adjust this. A user defined percentage decrease is evenly spread over a vertical launch angle range from a user defined launch angle to 60 degrees. 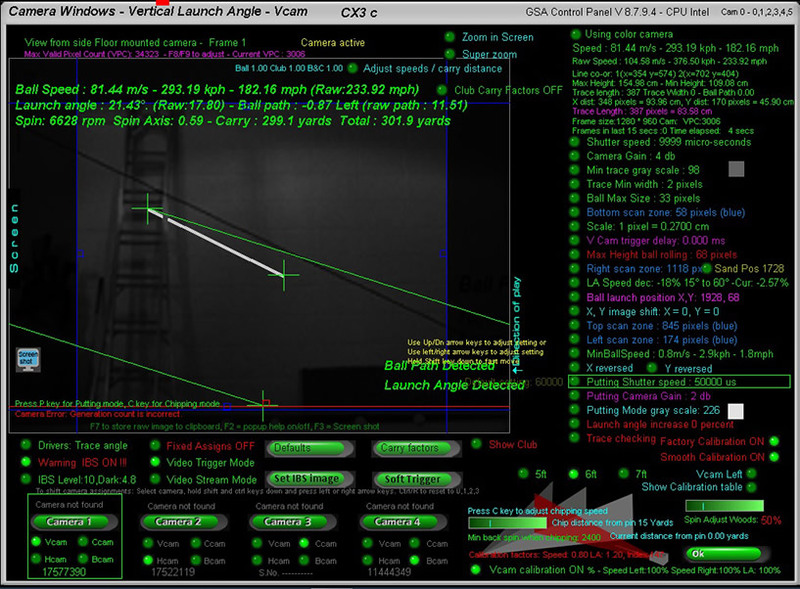 The above image shows a setting that would gradually take 25 percent off the speed over a vertical launch angle range from 40 degrees to 60 degrees. The spread is then 20 degrees ( 40 to 60) which means that the ball speed will be reduced by 1.25 percent (25 / 20) for every degree over 40 degrees. When setting, use the left and right arrow keys on your PC to adjust the percentage or speed decrease and the up and down arrow keys to adjust the vertical launch angle range. 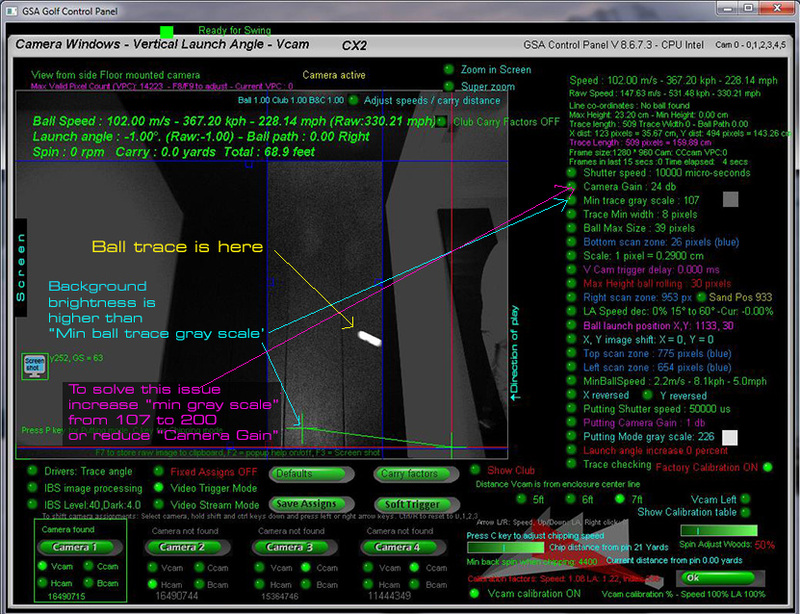 Speed controls are also displayed in every camera window when "Show Trajectory" is on. 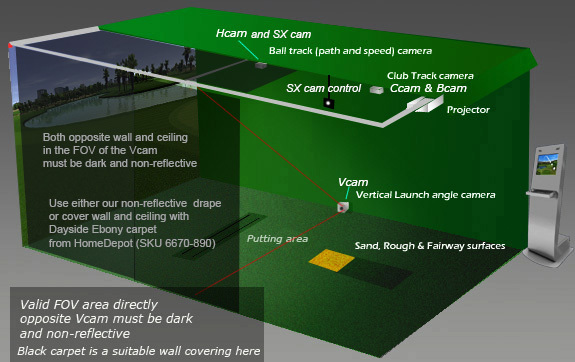 When hitting balls left or right, the ball will either be getting closer or nearer to the floor mounted Vcam camera depending on it's mounted position in the enclosure. i.e. either left or right. If the ball is getting nearer the camera then the trace will appear larger and thus the measured speed will be greater and if getting further away from the camera the trace will appear smaller and thus the measured speed will me lower than what it really is. To compensate for this, the CP offers two solutions: 1. A fixed calibration method, 2. a user adjustable linear method. In addition to L/R speed adjustments, LA adjustments may also be required when using the linear method (i.e. when calibration is switched OFF). This is automatically done when Vcam calibration is ON but wasn't available when using the linear L/R adjustments. L/R LA adjustments are now done using the up/down keyboard arrow keys and L/R speed adjustments are done with the left/Right arrow keys as before. 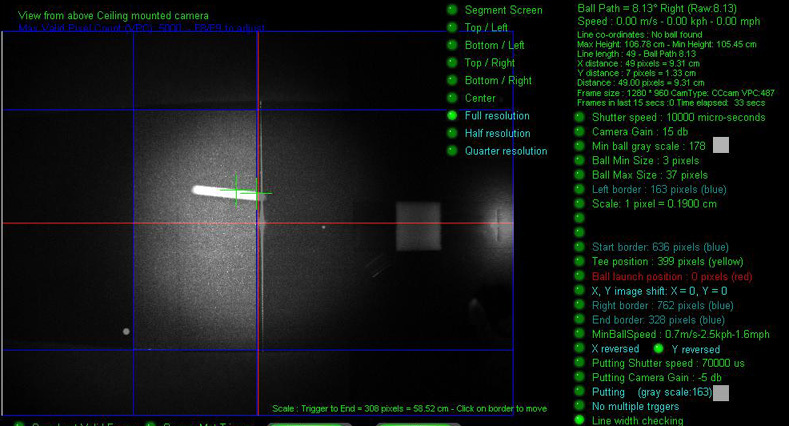 The overhead camera captures the trace of a ball to measure ball path. 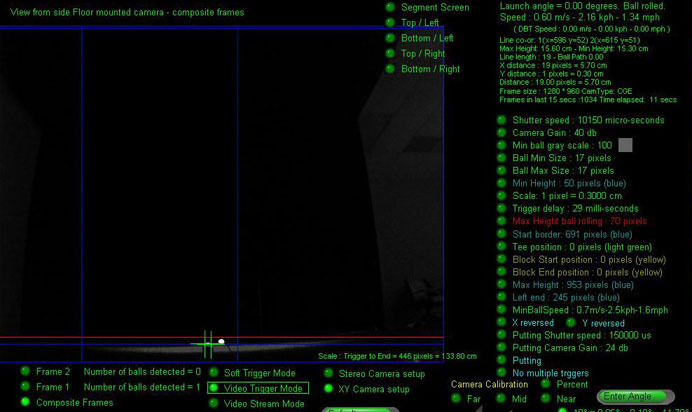 Setting the valid field of view of the Hcam camera. 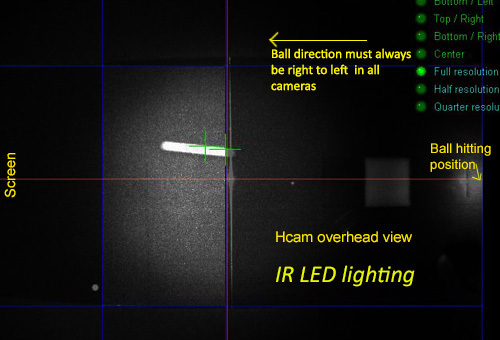 The Hcam overhead has a larger field of view but only a small strip is actually used to capture the ball's direction. This area is called the Valid FOV. Hit a ball to the screen to capture a new image from the Hcam. Using the controls set the valid FOV by moving the borders. Set the Start border just past the start of the ball trace, the End border to some 6 to 8 inches behind the Start border and the Left and Right borders to approximately the edges of the line scan area. We've had a number of requests add a lock mechanism to the CP so that unqualified persons do not play around with any of the CP's settings and setup. This feature is of particular interest to commercial indoor golf facilities and also home users that may have kids accessing the CP. The System Admin Mode is not particularly secure at the moment (i.e. anyone can switch it on or off without having to use a password) but better than nothing. Secure passwords will be added later. You can switch the System Admin mode on or off in the CP's Setup window. When on, any changes made to the CP's setup will not be saved so that re-starting the CP will bring the original setup back again. Some actions are blocked immediately but no all at the moment and those that aren't will not be saved. You'll probably find that - even with the longest shot - this value will be in the 2000 to 4000 value. The CP can only estimate putt roll distance as it doesn't know the green speed, terrain or break. Currently the roll distance is calculated from a speed/distance table made from putting at various speeds on a green in E6. However, users can now adjust this table as they see fit. In order to adjust all the distances, a putt should be made and then - temporarily using the scaling factor - adjust the speed to get to the required table entry. Once the individual cameras are setup and working, the system can be checked with just the GSA Control Panel running. With just the Control Panel running, after every shot you should see the "Launch Data Ready" message. 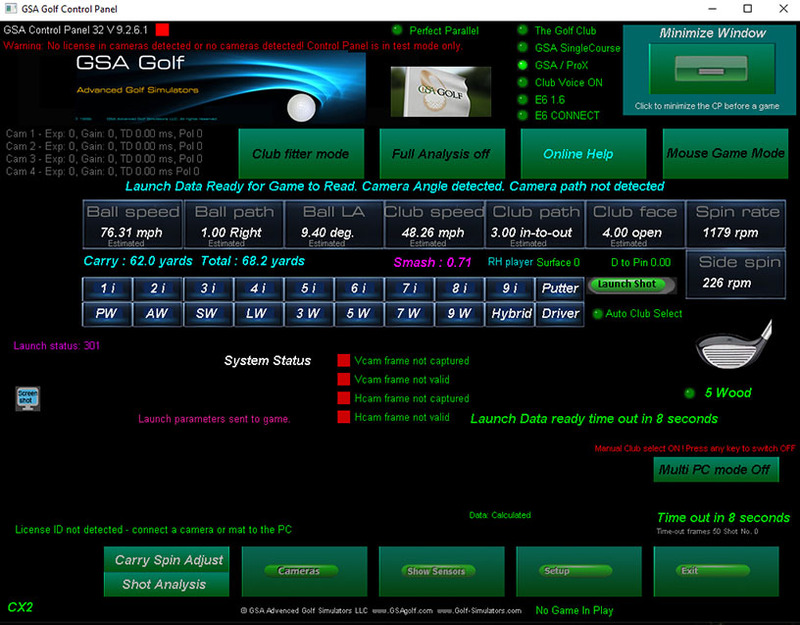 All parameters sent to the game software (E6, GSA Golf or ProX) are displayed. Click the "Show Club Angles" button to see the shot analysis screen. How to make Screen shots. Click on the "Screen Shot" to capture and save the current Control Panel screen. Note: Screen shots don't work when the software is running in full screen mode. 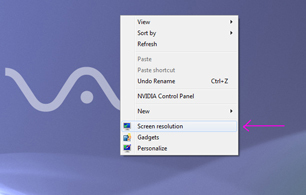 If required, increase the screen resolution to a higher level than the usual 1024 * 768. (right click on the Windows Desktop to select a higher screen resolution). When you do this the Control Panel will run in a window. You can then make screen shots. To test, don’t start GSA Golf or E6. Just GSA Control Panel with the Camera window open. 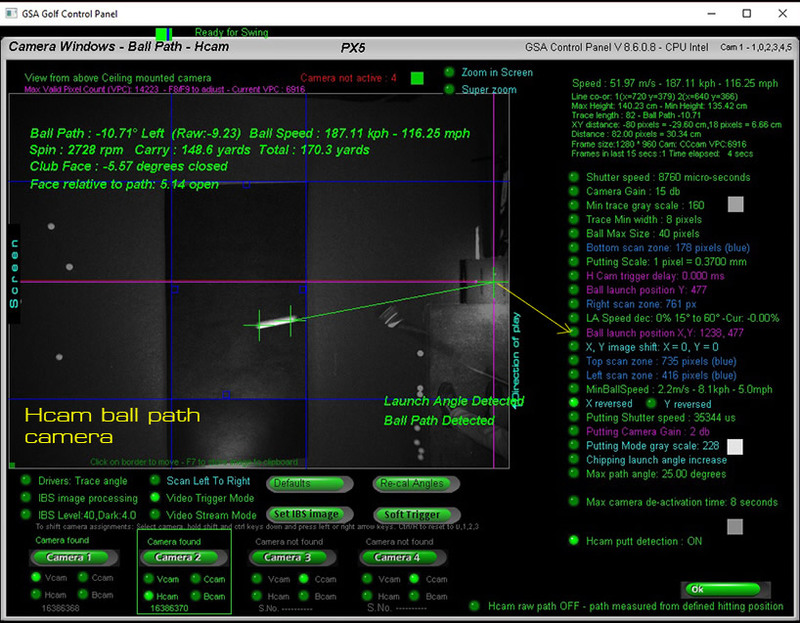 After each shot you should see the Launch Angle and Ball Path detected message. If not, then make a screen shot and send to us. To help with support we sometimes require the actual raw camera image and not just a screen shot of it. Note: When copying images to the Windows clip board with the F7 key, do not close the GSA Control Panel. Exit the Cameras window and click the Send Back button. Then start Paint and and paste. 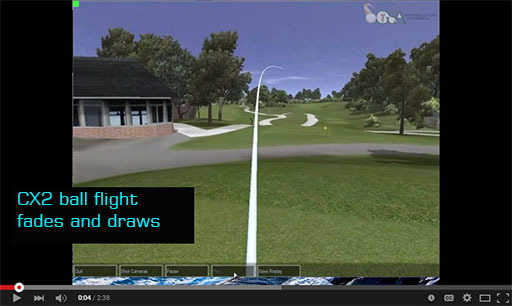 The above video shows how fades and draws can be produced with the CX2 system even though CX2 doesn't detect club face so that spin tilt or side spin can be calculated. 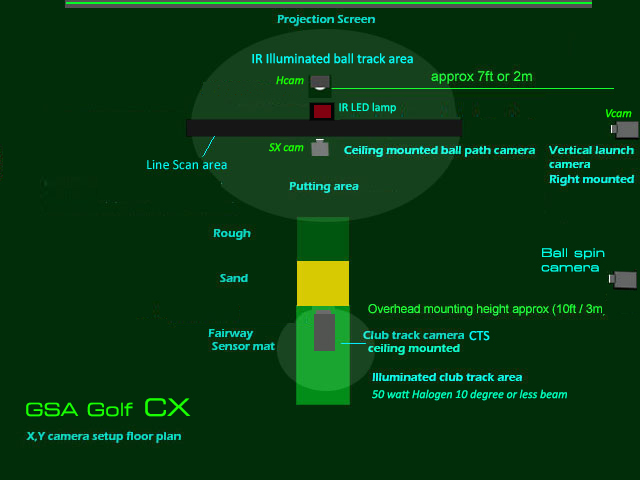 Club Tracking system (CTS) setup. Note: This feature is new and only available on versions 7.6.5.3 or higher of the Control Panel. To setup real putting , switch Real Putting On in the CP's main window. Go to the Hcam camera window of the CP (usually camera 2). Ideally you would embed a real cup hole into the flooring but you can also just mark a cup area in the flooring to simulate a cup. Take a soft trigger so that you see the cup in the field of view of the Hcam overhead camera. 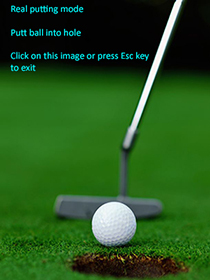 Using the keyboard's arrow keys, move the putting hole marker to the cup in the image and set it's size. Depending on lighting conditions and floor/cup color and brightness you may have to adjust the camera's shutter speed, gain and gray level setting. There are now separate real putting settings for this. 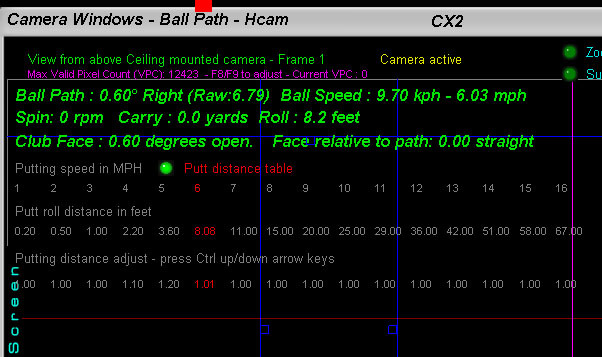 When in real putting mode the overhead Hcam camera will be continuously grabbing images to see if the ball is in the defined cup hole. The image processing just scans the cup area to see if any object is as bright or brighter than the defined Real Putting gray scale. To test, use the CP (control panel) without the game software running. From the CP's main window press the P key on the PC's keyboard to go into putting mode. You should see the below image being displayed. When you then place a ball in the cup or marked cup area. 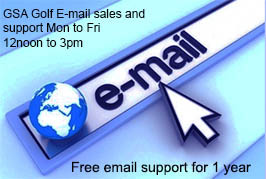 You should then see the ball in hole image. If not then decrease the real putting gray scale and/or increase the gain. If the "ball in hole" image is immediately displayed without a ball in the hole area then increase the real putting gray scale. You can repeat the testing process by pressing the P key on the PC's keyboard again to go out of putting mode and once again to go back in. 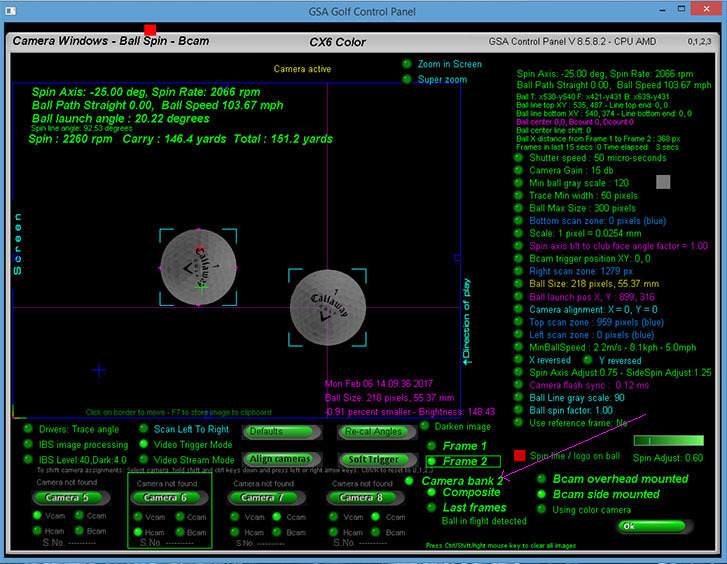 After this one time setup the CP will automatically go into "real putting" mode anytime a putter is selected or the ball is on the green in the game software. When in this real putting mode, the above image will be displayed in the game software. The player should then place the ball at the distance to the hole as shown in the game software and putt. Obviously there will be limitations to this distance. i.e. if your enclosure is only 20ft then you won't be able to place the ball correctly for a 30 ft putt. If the ball goes into the hole (or in the marked cup area) then the system will automatically go out of this mode and either the next player is up or you go to the next course hole. 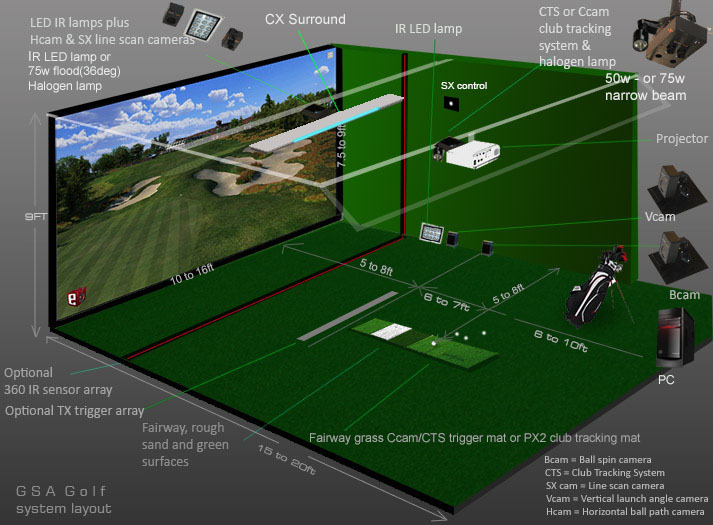 During this mode the cameras will not be used to detect any shots and the overhead camera will automatically grab frames to see if the ball is in the hole. If the ball doesn't go into the hole you can get out of this mode by simply clicking in the image or pressing the Esc key. 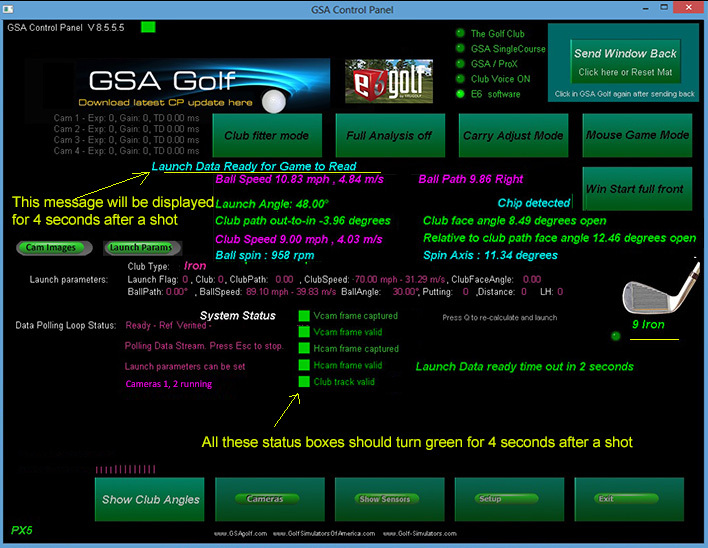 At present you have to keep your own score of the number of putts and set the Auto Putting mode to one shot in GSA Golf..
A later version of this software will allow the user to enter the number of putts into the game software to keep score. 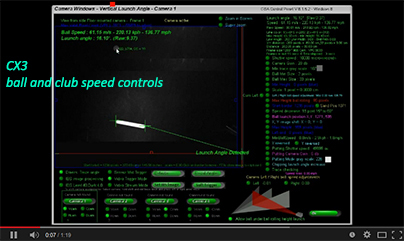 Speed controls are displayed in every camera window when "Show Trajectory" is on. 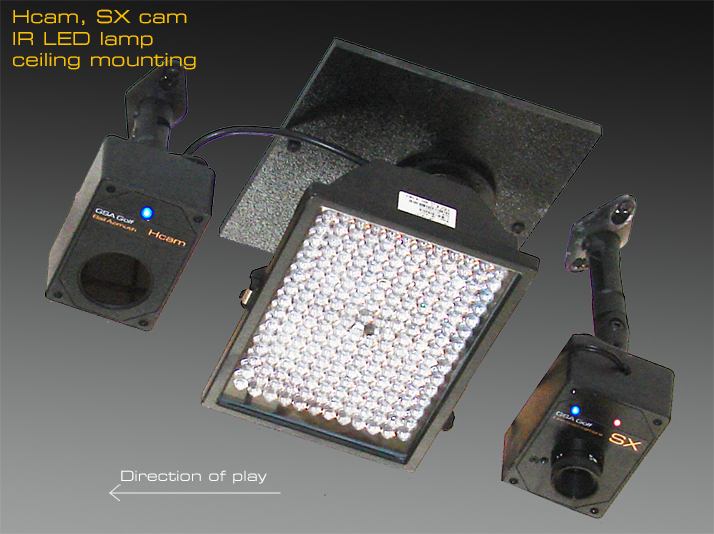 Each camera has its own individual set of working parameters. These settings are preset but can be adjusted if required. 1. Shutter speed (set according to lighting conditions) Default is 10,000 micro seconds. 2. Gain (set according to lighting conditions) default is 20db. 3. 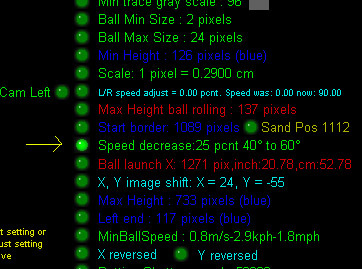 Min Gray Scale: When images are captured, software scanning routines will look for a golf ball in the image. In order for the search to succeed there must be a good contrast between the background and the ball. Depending on lighting conditions this contrast may vary. ie. the background may not be as dark and the ball not as bright. In any case, the ball must be distinctively brighter than anything else in the background. You set this Minimum Gray Scale parameter to the minimum brightness (or gray level) of the ball. The value is from 0 (black) to 255 (white). 4. Ball min and max sizes: Depending on the distance the ball is from the camera, the image size of the ball will vary slightly. 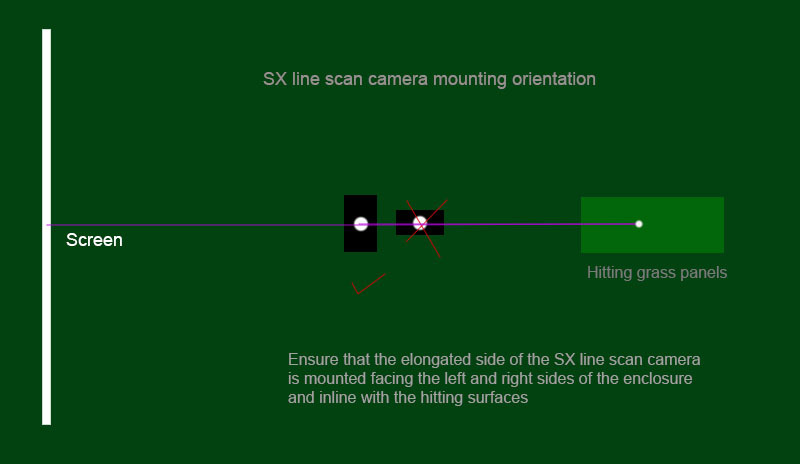 The scanning routines use this value to help identify a golf ball within the image. 5. Min Height, Max Height, Left end, Start border: These four parameters dictate the valid Field of View (FOV). This is used to block out any parts of the image that may contain static objects in the camera's field of view (e.g. the floor) that may cause problems for the ball search scanning routines. The scanning routines will only search within these borders of the image. Max Height for a rolling ball: Set this red border line to the maximum height a rolling ball will have as seen through the camera's lens. All balls found under this level will then be considered as a ball rolling on the ground. 6. 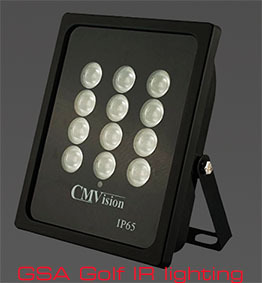 Min Ball Speed: For the vertical launch monitor camera only, the ball must attain a minimum ball speed to pass within the cameras FOV in a straight trajectory line. 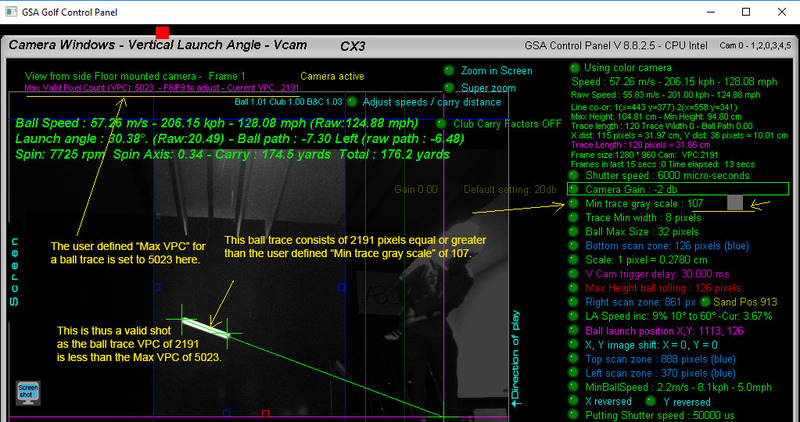 If the ball is hit with a slow speed (ie a chip) its trajectory will curve down within the cameras valid FOV and the calculated launch angle will not be correct. 7. Ball Launch Position: When set to the launch position - ie where you strike the ball - the launch angle will be calculated from this co-ordinate to the first co-ordinate in the ball trace. 8. Software Trigger: All cameras are triggered by an electrical signal sent to the camera when a ball or club head passes over one of the optical camera trigger sensors. When testing and during setup you can simulate this hardware trigger by clicking this button. 9. Camera Assignments: The 4 radio buttons under each main Camera button allow you to assign the camera to a particular function. 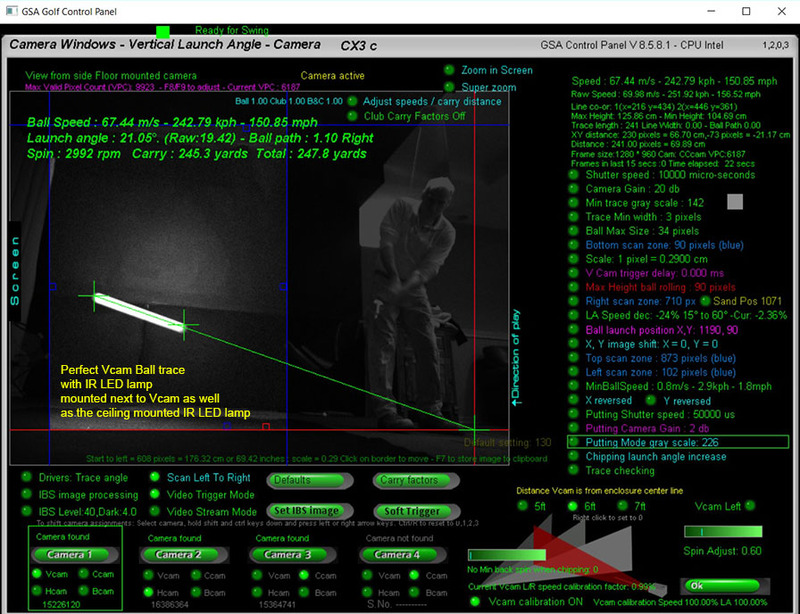 The 4 functions are : Vcam - Vertical Launch Angle and ball speed, Hcam - Horizontal camera for ball path, Ccam - Club track camera and Bcam - ball spin and spin axisi tilt detection camera. 10. Video Trigger mode , Video Stream Mode: When a camera is in trigger mode, frames will only be captured (grabbed) with either a hardware or software trigger. When in Video Stream mode, frames will be live captured and displayed at the standard frame rate in real time. 11. X,Y shift and X Y reversed buttons: These buttons allow you to move the image in the field of view (FOV) instead of having to physically move the camera. If the camera has been mounted up side down or left to right you can correct this by reversing the camera axis image instead of re-mounting the camera. 12. Segment Screen: The camera image displayed is only half the actual size of the image. This is because the size of the image is greater than the window. When in Segment screen mode you will see a segment of the full size image. This is either one of the four corners or the center. 13. Defaults button: Press this button with the shift key down to set all parameters to their default values. Ensure all settings are cleared by holding the ctrl key down and clicking the Enter button. 15. Scale: The system uses this value to calculate the distance the ball has traveled and - with the shutter speed - the ball speed. 16. 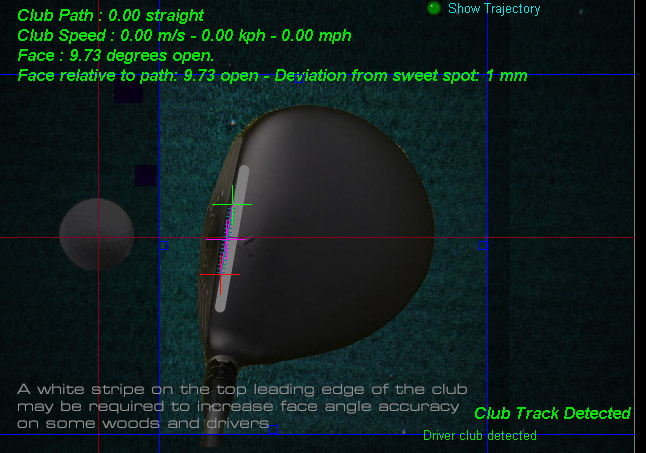 Drivers: Trace angle Select this option so that when teeing off the launch angle is measured only from the trace and not from a pre-defined launch position. The system then doesn't need to know the tee height. 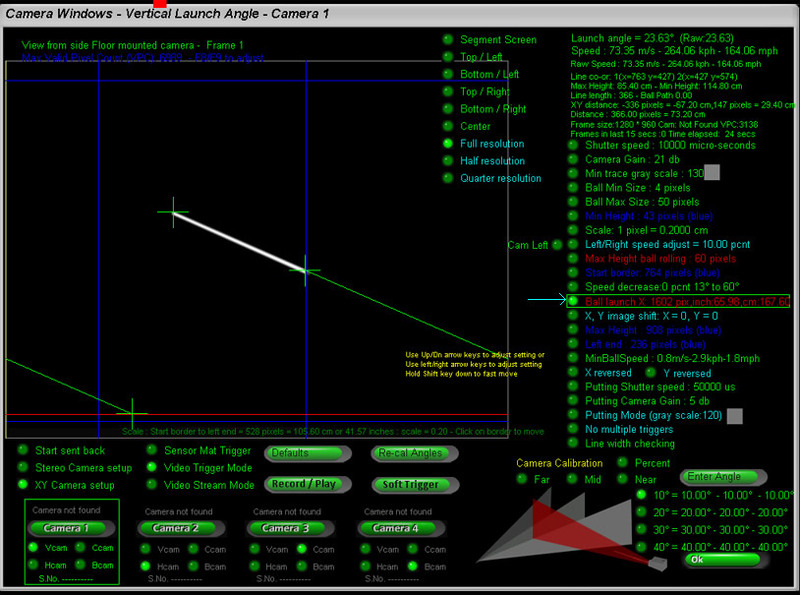 Segment screen: The camera's resolution is double that of the camera view window. 17. 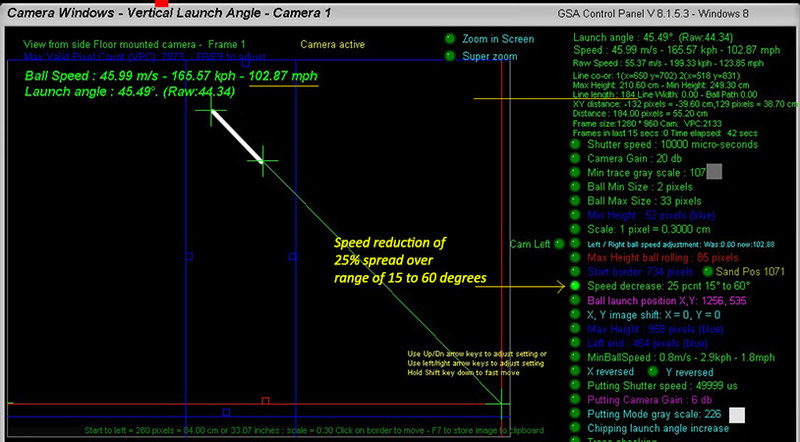 Putting Shutter speed (set according to lighting conditions) When putting, a separate camera shutter speed and gain setting will be used in order to account for the much slower ball speeds. 19. Putting Indicator set when putting and is only used for test purposes to show which shutter speed and gain setting is used. 20. No multiple triggers Select this option on to prevent the following club head from re-triggering the cameras after the ball. The default setting is always on. and not any other object or persons in the valid FOV. It is mainly used to avoid inadvertent shots being launched when players walk over the camera trigger sensors to pick up balls. 22. RAW angle Raw angles are those that are calculated directly from the captured image frame without any calibration. 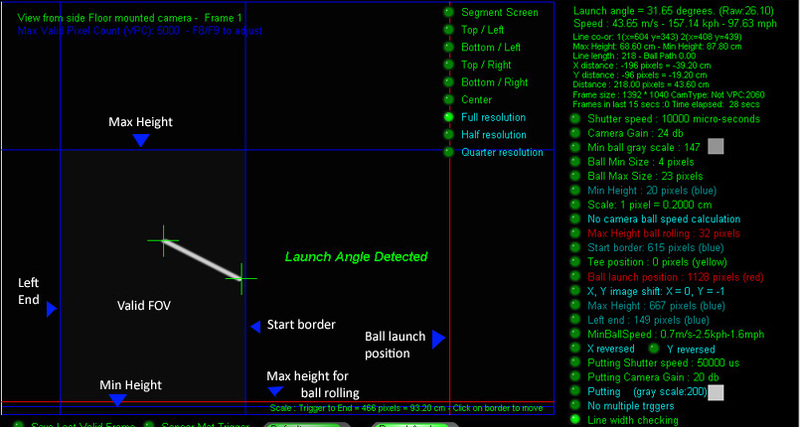 When a fixed ball launch position has been set (by moving the "Ball Launch X" line behind - to the right of - the Start Border the "Launch angle" will be the calculated from this position to the end of the trace. The Raw angle is the angle between the two ends of the ball trace in the image. 23. Cam Left click this if the floor mounted camera has been mounted on the left side of the enclosure. 24. Left/Right speed adjust when hitting the ball to the left or right the ball trace in the camera image will appear slightly shorter or longer. If the ball is traveling towards the camera the trace will appear longer, if away from the camera it will appear shorter. 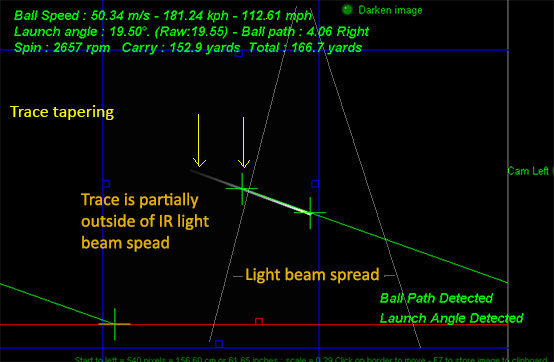 As the length of the trace determines the ball speed some adjustment is required to compensate for this. The ball path range is -20 to +20 degrees and this adjustment percent factor is used to adjust the ball speed in gradual steps. e.g. If this percentage is set to 10% and the ball's path is 20 degrees towards the camera then the full 10% will be subtracted from the ball speed. If the ball's path is only half this - i.e.10 degrees towards the camera - then half of this percentage i.e. 5% will be subtracted from the ball's speed. 25. Allow ball under ball rolling height some very low shots start under the maximum height for a ball to roll. Select this option on to allow the system to detect very low shots. 26. Motion sensor on We have a new motion sensor that detects if someone is moving around in the enclosure and in the field of view of the cameras (usually to pick up balls). In this situation it is possible that the system will inadvertently detect what looks like a ball and launch a shot in the game. The motion sensor will temporarily de-activate the cameras to prevent this. 26. Sand Pos / Rough pos click once for Sand and once again for Rough If you have sand and rough panels then the system should know where these are so that when you play from these positions the correct launch angle will be measured. The positions are shown in faint yellow and dark green lines just in front of the normal launch position. Adjust to the middle of the sand and rough panels. The System Setup section should show what optical sensor systems - if any - and what cameras are being used. Use the product Presets at the top of the window to set these automatically. If you have Sand and/or Rough panels set these two options on. 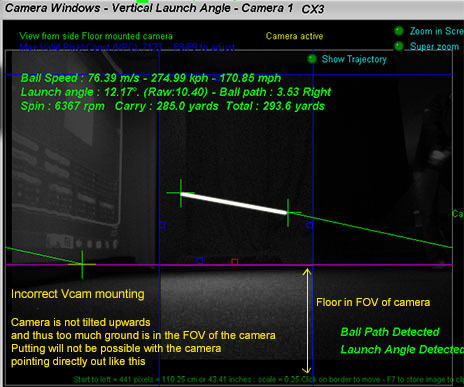 The system will then calculate the launch angle from the positions you have set these in the Vcam window. If you have a Sand and/or Rough Panel and play from these when the ball is either in the Sand Trap or in rough the system won't pick up any valid club data. Switch the Allow ball launch with club data with SW on in this case. If you are experiencing camera shutdowns during play or CP hangs then this is usually due to the USB cable length being too long. The camera manufacturer strongly recommends that the USB cable be no longer than 5m or 16ft and that they can't guarantee stability when extending - even with active USB hub cables - beyond this length. We've noticed that some PC's and cables work better than others so you may find that all is OK with cable lengths up to 26 ft but if not then you'll have to place the PC closer to the cameras in order to keep the cable length to 16ft. Accessing the PC can then be difficult. In this case we recommend extending the keyboard / mouse and monitor cables rather than extending the USB cables. Image tearing is when the captured image from the camera is split or only partial images are captured by the camera. In multiple camera setups the images or parts of the images appear swapped. ie whole or part images from one camera appear in the frame from other cameras. The cause of this is either insufficient bandwidth on the USB bus or insufficient power being delivered to the camera via the USB bus and/or cable. The solution is to use separate USB buses and powered USB hubs for each camera. 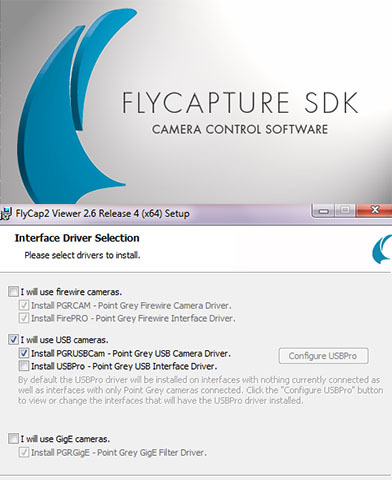 This simply means adding a new PCI USB port card for each camera. These are quite inexpensive (around $25.00). USB camera cable length problems are often overcome by using a separate powered USB hub such as the above unit that costs just $26.00. Image tearing is where the images of 2 or more cameras get mixed up. The problem is caused by too much data coming in on the USB bus at the same time causing the bus to overload and drop data. The issue is often only sporadic and usually only arises on slower PCs. The usual method of fixing this problem is to either add a separate USB PCI card to the PC , replace the PC with a faster one or adding powered USB hubs. 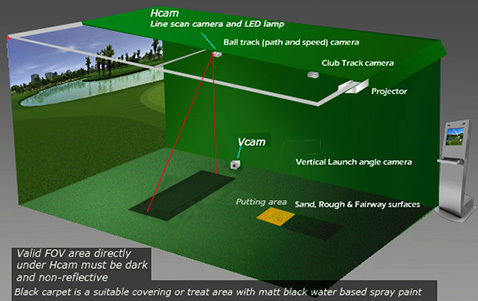 The issue is primarily with the ball tracking cameras (V and H cams) that get triggered at the same time - in contrast to the CTS camera which is triggered a few milliseconds beforehand by the club. This is usually caused by insufficient contrast between the ball and the background so that the cameras can't find or recognize the ball trace. The faster the ball is traveling, the fainter the trace will be so it is important to have sufficient overhead lighting and that the background in the camera's field of view is a dark non reflective material. e.g. dark colored or black drapes. Equally important is that the light from the overhead lamps is not reaching the adjacent wall (vertical camera) and that there is little ambient light in the enclosure. ie daylight coming through windows etc. You wouldn't want this anyway as the brightness and contrast of the projected image on the screen would suffer. Camera is detected but goes off-line, dead or freezes after taking a few shots. This is usually caused by too long USB cables with weak or corrupt data. To test for this, connect the camera to the PC without any USB extension cables. i.e. just with the 6ft mini A camera USB cable. Go the camera window in the control panel and switch to Video Stream mode. You should see that the camera is capturing images at a steady 15 or so frames per second. You should also see that the green LED on the back of the camera is stays on. Assuming the first test is successful, close the control panel and disconnect the camera. Add one of the USB extension cables to the camera and repeat the above test. If you now find that the camera does not capture frames when in video stream mode then it is the cable causing the problem. If the USB extension cable is not an active one then replace with an active one that is no longer than 16ft. f you are experiencing camera shutdowns during play or CP hangs then this is usually due to the USB cable length being too long. 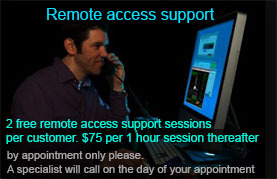 To help with support we sometimes require the actual camera image and not just a screen shot of it. Press F7 in the camera window to store the current image to a file. Note: Windows UAC has to be switched off for this to function. Default file name is "CamImage.bmp" located in the root folder of the ControlPanel. 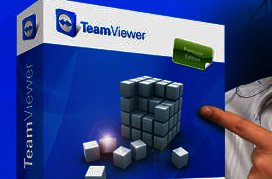 The image is also written to the Windows ClipBoard so you can paste it into any graphics tool like Paint. Note: When copying images to the Windows clip board with the F7 key, do not close the GSA Control Panel. Exit the Cameras window and click the Send Back button. Then start Paint and paste. We have opted to use a camera trigger method mainly in order to keep the price of the system as low as possible and to ensure that the image data is captured at a very precise and known time. Free running firewire cameras that are capable of 1000 fps are quite expensive and the image processing would usually require a second dedicated processor (ie PC) to process the images. You would normally require at least two cameras so the image processing would have to handle 300 frames a second. As the host PC is usually very busy rendering complex 3D scenes, it would not have time to do this. As you probably know all cameras - including video cameras - just take individual pictures (shots). If the camera takes upwards of 24 pictures per second (24 frames per second) and you play the sequence back it appears to our eyes as smooth motion. However, this is just an optical illusion as our eyes are relatively slow. In reality it is still a sequence of individual pictures (frames). If a camera is taking pictures at a rate of 24 frames per second then each individual shot takes 0.041 seconds (1/24). Although this sounds really fast, it is slow compared to golf balls traveling at up to 200 mph. Golf club heads and balls travel at high speeds (100  200 mph) and will travel comparatively long distances in 0.041 seconds. a club head traveling at 100 mph (160kph) will travel 6.14ft (1.86 meters) in 0.041 seconds. a golf ball traveling at 200 mph (320kph) will travel 12.28ft (3.72 meters) in 0.041 seconds. is not possible in the confined space of a golf simulator enclosure. 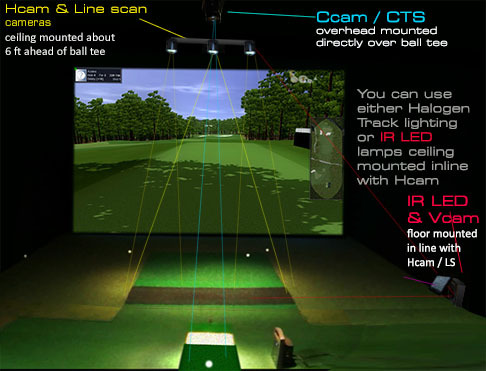 The object of cameras in a golf simulator is not only to capture the ball in flight but also to measure its speed. For this we would require at least two frames taken at a known time interval or time frame. We can then detect the distance the ball traveled in this time period and thus calculate its speed i.e. Speed = distance/time. then the camera must be able to capture the two frames within 3 ft (90 cm). ie half the FOV. We would thus need a camera capable of capturing frames at 4 times the normal rate of 24 frames per second. ie 96 frames per second. the camera’s FOI (Field of Interest) would have to be down to only an inch (2.54cm) or so. capable of capturing frames at a rate of around 4000 frames per second. Such cameras exist of course but the price is prohibitively high (upwards of $10,000). so there’d be no time to process the incoming data from cameras at these high rates. You would basically require a high performance PC for every camera. in time when the club head is just before the impact to the ball. The trigger is generated from the overhead mounted line scan camera. The host PC is then free to do all the wonderful 3D graphics rendering and is only interrupted when a incoming image arrives from a trigger signal.